AIC Ksirai are the regional girl's volleyball champions after they beat Metroplitan's Soweto in the final. 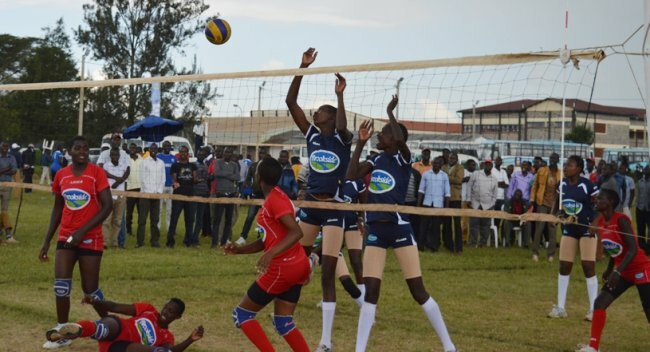 AIC Kosirai Girls, on Friday clinched the girl's regional volleyball title by turning tables on national champions, Soweto in the final of the East Africa Secondary Schools Sports Association championship in Eldoret. This match was a repeat of the national final in Kisumu which Soweto won. But, AIC Kosirai appeared to have done their homework well to win 3-1 in an explosive final at Eldoret Polytechnic. It was Kosirai who worked hard to win the first set 25-22 after Soweto's spirited fight at nine points saw Kosirai stagnate at 17 before the teams were level 22-22. Poor service cost Soweto this set. Soweto came in the second set an improved side bolstering blocks and service taking it in 25-22. Vivian Cheruto was instrumental for AIS Kosirai with accurate spikes in the third set which they won 25-16. They won the fourth set by the same margin. The most valuable player Cheruto said: "We had victory in mind but playing with Soweto was the hardest game." Soweto had beaten AIC Kosirai in the pool matches same as at the nationals where Soweto beat Kosirai in finals after defeating them in group stages. Lugulu Girls finished third after beating defending champions Group Scolaire Indangabureti (GSI) of Rwanda 3-2. GSI won the first set 25-23 but Lugulu won the second 25-11 and lost the third 24-26. They bounced back to win the fourth and the decider 25-11 and 25-10. Kenyan team dominated in both boys and girls events on the final day at Testimony School in Eldoret. Kenyan swimming team boys category received 25 medals, 8 gold, 12 silver and 5 bronze, while Burundi followed with six medals, 4 gold and 2 bronze while Rwanda were third with five medals, 3 gold, 1 silver and1 bronze . In the girls' category Kenya collected 28 medals;12 gold, 12 silver and 4 bronze, while Uganda had 7 medals, 2 gold, 1 silver and 4 bronze. Rwanda came third with 5 medals, 1 gold, 1 silver and 3 bronze. Debutants Barding Boys from Kenya will face St. Mary's Kitende of Uganda in the final at Kipchoge Keino Stadium. Barding narrowly beat Kibuli Secondary School of Uganda 1-0. Denis Oduor scored the lone goal from the spot in the 87th minute. In the second semi-final, Kitende beat Kenya's Bukembe 2-0. Francis Omekalot put Kitende ahead in the 22nd minute for a 1-0 lead at halftime. Bukembe was good on passes but towards the end of the game relaxed. Willy Ochen doubled the scores in the 74th minute. Bukembe captain Benjamin Masai blamed the defeat on the poor officiating and lapse in their midfield. "We played well but our mid died and we could not get the balls in front. Also referee could not award us penalties despite several fouls in the box," Masai claimed.